but also a strong producer of flexible and harder aluminum tubes. We supply various tubes in diameters of 11,13.5,16,19,22,25,30,32,35,40 mm with nozzle or membrane. The aluminum purity exceed 99.73%, you can read more information in the testing report of EN13046:2000. 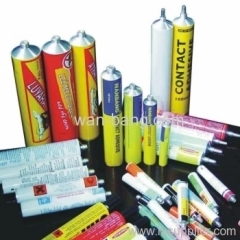 All of our tubes are used for glue, adhesive and cements etc.